Learn how to use IT Operations Management to become a strategic player in your organization. Get Aware. The key to ITOM is not drilling down into the details of the infrastructure, but looking up and becoming aware of operations management in the context of how their organization uses technology to accomplish its business goals and objectives. Get Smart. You are aware of the importance of a steady state in IT to support business agility, and are aware you need to implement some level of ITOM to accomplish that level of stability, but you haven’t yet gotten smart enough to know how to cope with the shear volume of alerts you are about to confront. Get Automated. A SDE can use ITOM automation as a way to capture the collective intelligence of your IT team and put it in an appropriate tool where it can be applied consistently in a repeatable fashion. 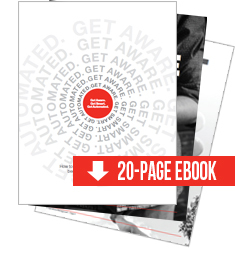 To learn how you can Get Aware, Get Smart and Get Automated, just submit the form to the right and you'll instantly receive a link to download the ebook. If you have any questions, please contact us at 866.456.4422. Please provide up-to-date information below and we will instantly redirect you to a downloadable copy of the eBook.